This week’s 52 Ancestors in 52 Weeks challenge by Amy Johnson Crow focuses on the Black Sheep in the family. I have a few relatives who are black sheep. Pinpointing a direct line ancestors is a bit more tricky. I don’t know that much about them. After some information surfaced recently, I have to wonder. Was my 3rd great grandfather, Martin J. Kelly, the black sheep of the family? I’ve written many times of how I thought Martin was scraping to get by in San Francisco. Until I started going through land records, I had no idea the wealth that he had. What lead me to my first impression? In the 1880s the city of San Francisco was in dire need for land. It was a booming city and every square inch became important to progress. Within city limits were cemeteries. The city government decided to close them down and have the burials moved outside the city. An official ordinance was passed in 1900, but it appears from the records that reburials began in the 1880s. I first learned that my Kelly and Dolan relatives were involved in this when I ordered records from Holy Cross Cemetery in Colma, CA. Among the pages of copied file cards were several for Kelly family members who had been reburied in the mid 1880s. On each of these cards the person who paid for the reburials was Patrick Dolan, Martin Kelly’s brother-in-law. And thus, I determined, poor Martin Kelly must not have had enough money to pay for the reburials of his wife and children. 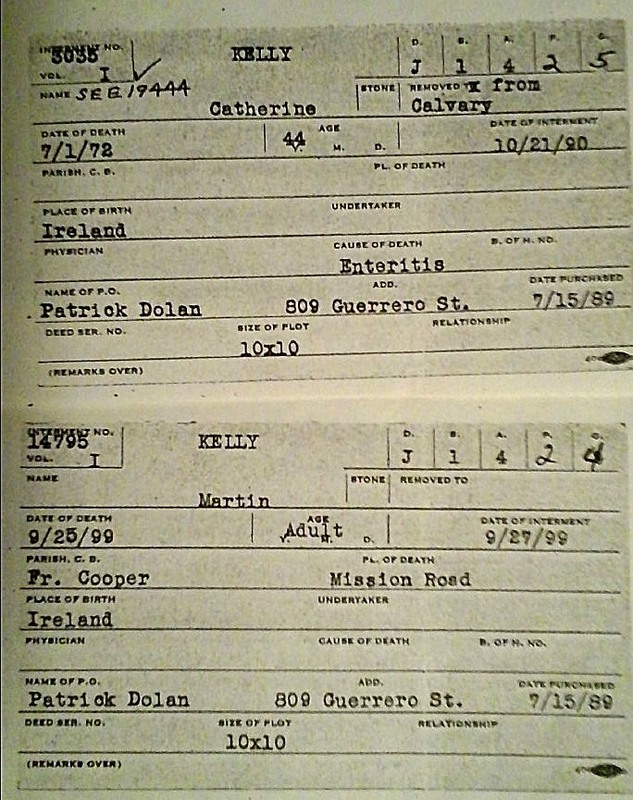 These two cards show that Patrick Dolan paid for the reburial of his sister, Catherine (Dolan) Kelly, and handled Martin Kelly’s burial. But, I was wrong, so wrong. Martin Kelly was doing just fine. He had multiple tracts of land in two counties. He owned and operated at least two boarding houses and saloons. When he died in 1899, he left behind considerable assets. So, why didn’t Martin kick up the money for the reburials? I am not sure. But, I’ve found a couple of things that might prove there was a split in the family. After his wife’s death, Martin’s oldest son went to live with his aunt and uncle, John and Anna Kelly. Michael was crippled, but worked in their saloon as bartender. As mentioned, Michael’s father owned similar businesses, why didn’t Michael live and work with his father? There could be good reasons. Perhaps Michael needed help in certain ways and his aunt and uncle were able to provide the assistance, but his father was not. We’ll let Martin slide on this one. Their are the notices in the newspaper of illegal boxing matches at Martin Kelly’s saloon. And their was the incident where he shot a man who owed him money. He was never charged since authorities decided the guy deserved it. Again, not much to go on. San Francisco was a rough and wild city, I am sure Martin was not the only one who got into occasional scrapes with the law. Then, there is the curious omission of Martin’s name on the family tombstone. As I mentioned, hsi wife and children were reburied at Holy Cross cemetery in Colma, CA. There is a beautiful headstone at the foot of the family plot. It lists Catherine, Martin’s wife. Their son’s names are on the stone, too. But, where is Martin’s name? 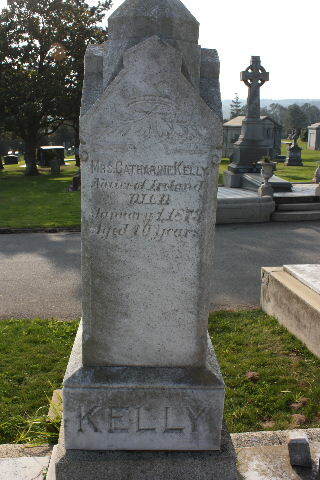 According to the FindaGrave volunteer, an employee at Holy Cross informed him that Martin Kelly’s name was never added. He was buried in one of the unmarked graves in the family plot. Imagine that! Martin died owning several properties, a couple in high value places, but no provision was made to add his name to the tombstone that bears his wife’s name. Nor did anyone put up another stone just for him. It seems odd indeed when you consider that he had three adult children alive at the time. Any of them could have ordered the job done. Add to this that his daughter, Mary (Kelly) Meincke, was the administratrix for Patrick Dolan’s probate. This is the same Patrick Dolan who paid for all the Kelly reburials. There might be a perfectly logical answer for the omission. Martin might have requested that his name not be added to the stone. Or, since Patrick Dolan handled all the reburials and Martin Kelly’s burial, we might point a finger at him. Maybe Patrick didn’t like his brother-in-law and this was his last comment on the whole thing. Banish him to obscurity. There is also one last story, an unverifiable story as many of them are. I have vacillated over who this incident referred to, Martin Kelly or John Charles Jones, my great great grandfather, Thomas Augustine Jones’ brother. My grandmother firmly believed the story referred to her great grandfather not her great great uncle. Thomas Augustine Jones was widowed in 1889. My great grandmother took over the “mother” duties in the household being the oldest daughter still at home. She did not marry until the age of 23. Even after marriage Thomas lived with her. As the story goes, Margaret and Thomas were home one day when someone knocked on the door. It was a solicitor to discuss someone’s will. Thomas because furious. He yelled at the man “There is no legacy!” and slammed the door in his face. End of story. Was this conversation about Martin Kelly? I may never know. I guess if I find his will I might have some answers. Did Martin Kelly leave his children anything in his will? I know from property records that his land was sold off to non-relatives. What I don’t know is who he left the rest to. His probate file, if it has survived, might lay some of this to rest. For now, I am left to wonder if Martin Kelly was kicked out of the family or not. Many San Franciscans, including some that are famous, are buried in the cemeteries in Colma, California. There are a little over 1790 residents, but the city claims 1.5 million souls live there. Holy Cross and Cypress Lawn are two of the cemeteries located here. It is an interesting history for the small city that borders San Francisco.